Although it indicates that summer is about to end, Labor Day is a legal holiday which celebrates the economic and social success of American workers. Without these workers, there would be no long history of dedicated and diligent managers, staff, employees, businessmen and entrepreneurs in US. Prior to the celebration of the long weekend, now is the right time to take a look at the policies of your business insurance. Make sure that they remain active to meet your needs and the needs of your workers. It’s easy to get business insurance, pay the monthly premiums and not to have a second thought. But as your business progresses, so do your needs. 1. Commercial Auto Insurance. Are your employees starting to join meetings at off-site areas, like going to other company offices? Regardless of what business you have, start adding vehicles to be driven by employees. It’s important not to overlook commercial auto insurance because it takes care of your workers and business. 2. General Liability Insurance. At times, even a minor accident can cause a complicated lawsuit. The possible risk will tell the right level of general liability insurance needed by your business. Such level of danger can vary and will need adjustments to your products, services, employees and business size. 3. Commercial Property Insurance. This type of property insurance is vital as it covers more than just the building wherein your business is located. Buying new equipment or starting to add bigger number of inventory would require re-examining your business insurance. 4. Commercial Umbrella. As time passes by, you need to evaluate again your policies. It can be the right time to include a cheap commercial umbrella policy to further the level of your security. If risks seem to be getting higher, commercial umbrella insurance is very important. 5. Business Income Insurance. For lots of small companies, their profits increase as their business continues to grow. Therefore, it’s crucial to keep insurance policies updated to reflect your income. 6. Workers Compensation Insurance. For nearly a century now, the laws on workers compensation have been a securing factor of American workers, especially those who incurred injuries while working. This type of insurance is a sure protection to employees, helping them pay their medical costs and lost wages. You should have this appropriate coverage to secure your invaluable workers. 7. Employment Practice Liability Insurance. Arguments and disputes are among the common reasons for lawsuits. As the company grows and your workforce also grows, you should add this type of insurance also. Before allowing resumes to fill a vacant position, make sure you’re covered with a larger protection. As Labor Day comes in, spend time checking out your business insurance policies. Insurance providers have a team of professionals who specialize in answering difficult questions that concern your full protection. The needs of your business will be assessed and providers will do their job within your budget. 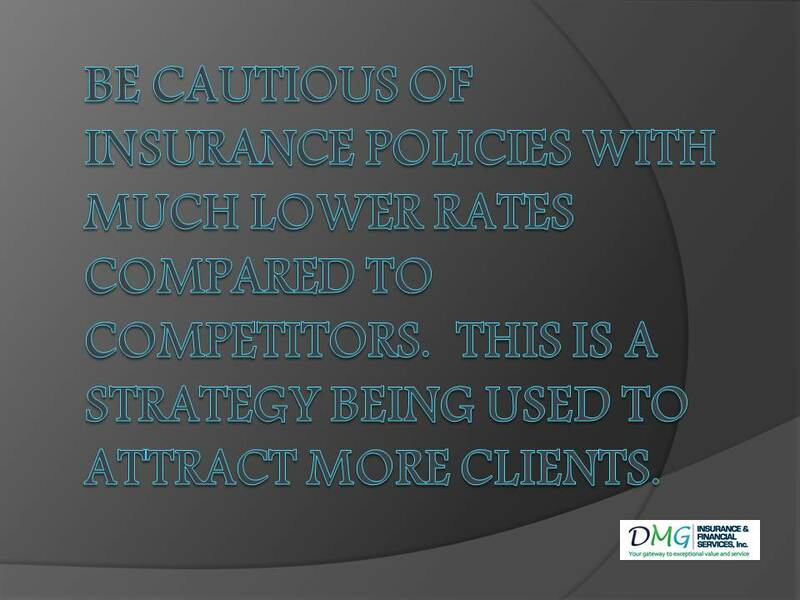 You will get the best coverage that fits the needs of your business insurance. To get additional information on Car and Travel Insurance in Florida, please contact us at DMG Insurance and Financial Services, Inc. (http://www.dmginsurance.com) at 543 N State Road 7, STE 106, Royal Palm Beach EL, 33411, phone 561 422 7071, Fax 561 422 7072. With the right insurance in Florida, it‘s a smart decision to care enough for the future. In Florida, car insurance is required and so is health insurance. Typically, there are various health insurance available in Florida designed to protect people’s personal and family’s health security. For health insurance, there is an existing coverage for individual or family group health care. Also, there are short-term insurance for medical insurance, dental insurance, health savings account, student’s health insurance and Medicare. For a small-sized business there is health insurance for the present employees of small businesses. Depending on the age of the family members, coverage in family and individual life is attainable in various premium rates. Majority of health coverage consider the age of the smallest child. The younger the child the smaller premium will be paid. If you dream of giving protection to your family, it is a better choice to pay for individual health coverage, rather than purchasing family insurance. Dental insurance in Florida is obtainable through a monthly premium. Typically, it covers every edge that has connection to dental health. Generally, having a short-term health insurance can already handle health costs for a certain period of time. Florida Medical Discount Card may be a small help, but not bad in settling eye care, medications and other related services. If parents are already paying for life coverage, Florida students can be engrossed in their own health insurance. It is helpful to students who are in college, universities and have joined in the school varsity, including other related activities. This insurance type assists in providing financial support for a minor accident and other emergency room expenses. There is also Health Savings Account that employs the use of taxes for significant savings in retirement bills and health coverage. Florida has the available Medicare health insurance for the elderly. Those 65 years olds and below are covered by Medicare as long as they show proof of medical condition. Today, Florida is also offering health plans that can benefit the small business employees. Florida offers different health insurance that match a small budget. Nevertheless, keep in mind that the most expensive or the cheapest coverage is not always the best coverage to pay. What matters most is that the coverage you take for health insurance is enough to provide the needs of your future. 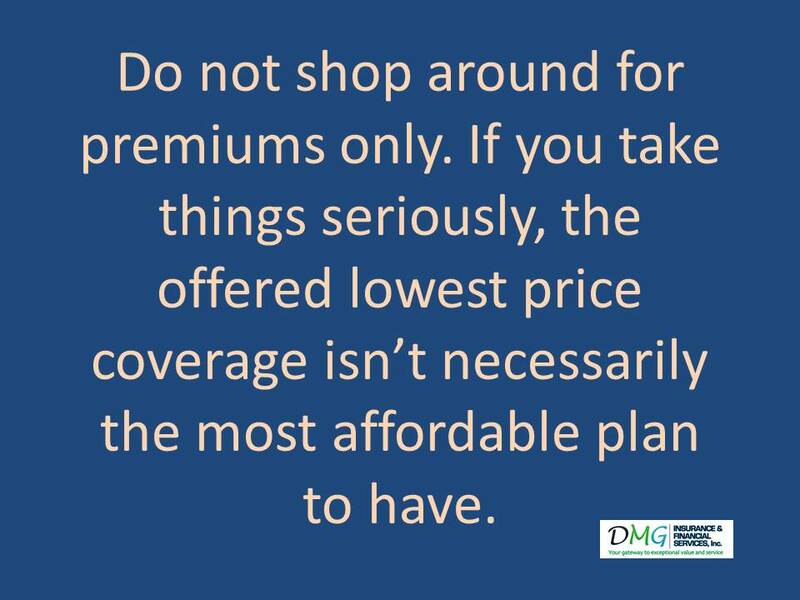 To get additional information about Florida Health Insurance Plans, please contact us at DMG Insurance and Financial Services, Inc. (http://www.dmginsurance.com) at 543 N State Road 7, STE 106, Royal Palm Beach EL, 33411, phone 561 422 7071, Fax 561 422 7072. The best answer to this question is to get the right money value for you and the top-notch customer service. Today, there are various selections of products on auto insurance that allow you to obtain the policy that meets your needs. Primarily, these include the types of basic car insurance coverage. In Florida, it’s required that all drivers must have at least $10,000.00 dollars for Personal Injury Protection (PIP) and another $10,000.00 dollars for coverage on property damage liability. All drivers in Florida are required to legally own their auto insurance, at least with the basic coverage of property damage liability. In case of car accident—where you are at fault—car insurance covers the property of the other driver. Serious car accidents are expensive, so it’s necessary to consider extra coverage for this. However, Florida does not call for bodily injury liability coverage. It simply means that if you are the person at fault for an accident, and the other driver gains expenses for the accident-related medical cost, your auto insurance coverage will not cover it. In Florida, bodily injury liability insurance is very important, and that means you are covered even if “at-fault” accident occurs. All drivers in Florida are lawfully required to buy PIP (Personal Injury Protection). It covers most of the medical costs, not only for you but also for your passengers. It does not matter who is the one at fault, PIP also covers partially the lost wages and all incurred services such as lawn task, housekeeping, child car, etc. Death benefit is also provided by PIP. By including this type of coverage, it will protect you in a smart manner. It does cover the repair of property and the replacement cost after a collision or accident—and you can also include rental car coverage for this. Having a comprehensive coverage means having more benefits in terms of vandalism, theft, fire and other damages. You can always select a higher deductible to be able to reduce your regular premiums. To know if you’re covered during an accident (in spite of the status of the other driver’s insurance), you have to include uninsured motorist coverage to your car insurance. The protection includes expensive medical costs and repairs caused by drivers without insurance, or if they lack the right coverage that covers damages. Find an auto insurance provider that offers range of uninsured motorist coverage to meet your insurance needs. To get additional information about What does it take to enjoy a great auto insurance policy in Florida, please contact us at DMG Insurance and Financial Services, Inc. (http://www.dmginsurance.com) at 543 N State Road 7, STE 106, Royal Palm Beach EL, 33411, phone 561 422 7071, Fax 561 422 7072. Skilled thieves make their living out of car theft. They can do this because they know the deception that you’re not aware of. To eliminate this, take a few precautions to avoid becoming a victim of car theft. Consider the following tips on how to prevent car stealing to avoid high premiums. By layering anti-theft devices, it creates a strong way of stopping car stealing. If you have the right combination, you safeguard your car in various ways and eliminate the opportunities of having it stolen. The sound of an alarm will definitely control the thief in his attempt to steal your car before he even succeeds in doing it. The use of immobilization device will put an additional protective layer. It discourages the thief from hot-wiring your car. Many car models have already the built-in hidden button which the driver pushes to get it started. Likewise, smart keys contain an installed chip which keeps the car from starting if another key is used. A passive system that looks like a black box carried by an airplane. It stays there in the glove box and gets GPS details like trip time, speed and distance. Real-time tracking system that lets you track your car in real time using a mobile device. With several products, disabling the car’s starter is possible. This system alerts you when the car drives from where it is parked. When installing an anti-theft tool, put a sticker or a notice anywhere in the car so the robbers can see it. Never leave your keys inside the car. Whether you hang them in the ignition or store them in glove box, you’re helping the thief get what he needs if he wants to steal your car. Lock the car doors. Make a habit of regularly locking your car door. Before leaving the car, always double check to ensure your keys are in the proper place. Park in a properly-light space. Parking area without lights is the first thing thieves always look for. Auto theft has the effect on the rates of car insurance—whether direct or indirect. The rising incident of car stealing pushes the car insurance companies to raise premiums. If you have filed a claim previously, chances are your premium will be higher if you renew your car insurance next time. It’s worth the money and time finding ways to protect your car. 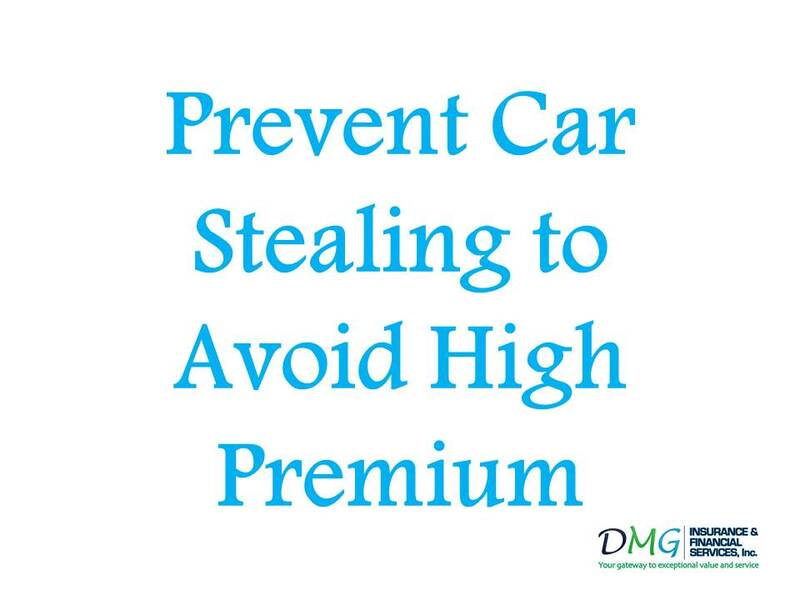 To get additional information about How to Prevent Car Stealing to Avoid High Premiums, please contact us at DMG Insurance and Financial Services, Inc. (http://www.dmginsurance.com) at 543 N State Road 7, STE 106, Royal Palm Beach EL, 33411, phone 561 422 7071, Fax 561 422 7072. Florida is one of the twelve states which require all licensed car owners to carry “no-fault” car insurance coverage. Since 1972, Florida no-fault law has undergone a reform, but lately it obligates that all drivers should carry no-fault insurance, together with a personal injury protection (PIP) plan. Most drivers have the notion that no-fault insurance covers all costs resulting from road accident, but there’s no truth on that. A car driver who causes the accident remains liable for compensation to someone who suffers death or physical injury. Let’s look at some of the main components of Florida’s auto insurance laws. You will learn about the types of car insurance and the amounts involved. You will understand better how Florida’s status, as a no-fault state, can affect passengers, drivers, and pedestrians when there is an accident. After a road accident, Florida allows a “no-fault” insurance in terms of paying auto insurance claims. Compared to other states considered as no-fault states, drivers are required to carry auto insurance which pays for the PIP benefits. When the insured person meets an accident, the personal injury protection benefits pay for the medical costs and other non-medical costs with relevance to the accident. Other non-medical costs related to accident come from loss of income and cost of hiring a person to perform household chores (otherwise known as “replacement benefits”). In terms of claims in auto insurance, Florida follows a no-fault car insurance state. All drivers in Florida should carry the least PIP benefits in their insurance policies. When there’s a collision along the way, every individual involved in the accident turns his own policy to pay the expenses for the medical care and related losses. Such benefits take effect irrespective of who is at fault in the crash. On the other hand, for the “at-fault” insurance state (also known as “fault” or “tort liability” state), drivers can have the choice whether to file claims with their insurance provider, file claims from the other driver’s insurance company, or bring the other driver to the court. Taking the driver to the court will prove that the driver is the one at fault and must be accountable to settle for the accident costs. Drivers in Florida can just go outside Florida’s no-fault system then follow a claim if such driver incurred permanent injuries caused by the accident. Claim is acceptable if permanent disfigurement or injuries occur, or if there’s loss of body function or body part. Not like other states, Florida doesn’t require the drivers to have benefits on bodily injury liability (BIL) which pays for the expenses of other injuries resulting from an accident. All car insurance policies should be bought from an insurance company which is licensed to perform business in the state of Florida. It’s obviously unlawful to drive without car insurance in Florida and the driver can have his license suspended. To reinstate the license, the driver must have the insurance to pay the fine, up to $500 for each violation. Drivers in Florida aren’t required to purchase uninsured/underinsured motorist (UIM) coverage. During the time insurance policy is bought, this type of coverage is offered by the car insurance company; however, the buyer can discard the UIM coverage provided they decline in writing. This coverage pays for the extra PIP benefits if the insured person is hit by someone who is not insured or doesn’t have sufficient insurance to cover medical bills–including other damages. 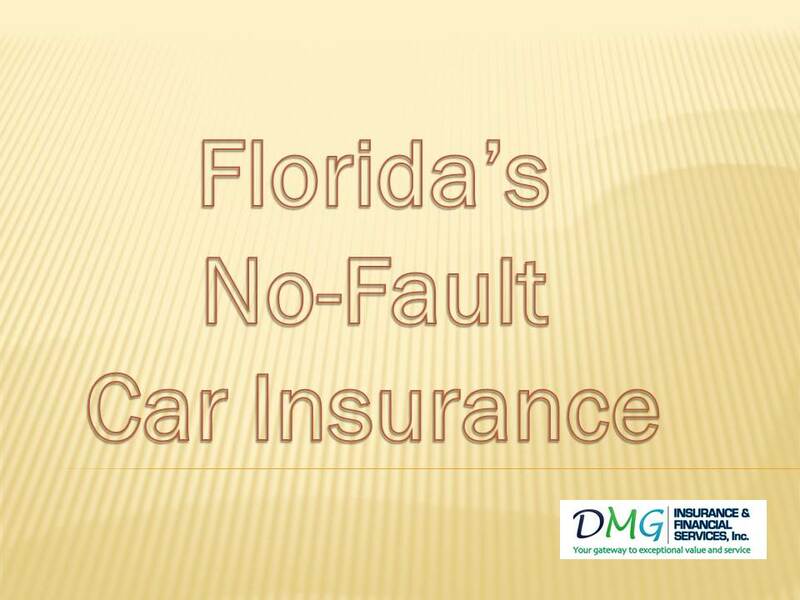 To get additional information about Florida’s “no-fault” car insurance law and regualtions, please contact us at DMG Insurance and Financial Services, Inc. (http://www.dmginsurance.com) at 543 N State Road 7, STE 106, Royal Palm Beach EL, 33411, phone 561 422 7071, Fax 561 422 7072. Generally speaking, car insurance for young people is more costly than the car insurance for older people. Simply because teens are younger, without experience and still doing their job to learn about driving. However, there are techniques how young drivers can obtain cheaper car insurance. What’s the reason behind having higher rates for teens? Based on statistics, teen drivers are more prone to car accidents, do traffic violations, get traffic tickets—as opposed to the older drivers. 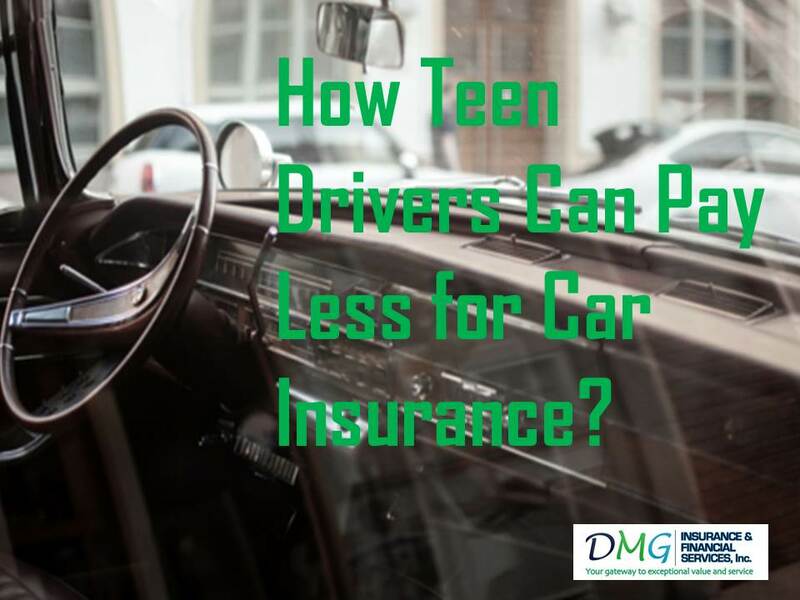 Most auto insurance providers consider these things when identifying the risks of insuring teen drivers. Do male teens pay more? Shopping online for Florida homeowner’s insurance can be worrying, especially if you don’t know anything about it. If it’s your first time to get a new home, searching for the right insurance option is necessary. You have to know exactly what your policy is and what it covers. Here are ten helpful strategies in finding the best coverage for your Florida homeowner’s insurance. If you have both home and car assets, savings will come to you if you move your two policies into a single insurance company. Begin by calling up the insurance company where you insured your home and your car. Then inquire if they have an option in getting discount for bundling policies. When a bundling discount is offered, get quotes from each company then select the best coverage that provides the right price. Liability limits and coverage must be similar for each quote so that you can compare apples to apples. Typically, homeowner’s insurance has the main dwelling including the other structures in the home—for instance sheds, garages, and others. Your insurance policy must also cover your home’s content and must give security against liability if there is an occurrence of injury. Although your homeowner’s insurance has already the liability coverage, it isn’t enough to give protection to you and to your assets. If the liability coverage is not enough and you were sued by a person, you may have out-of-your-pocket costs. State of Florida jurisdiction requires that it is compulsory for car owners to have their liability coverage. There are many car insurance providers that offer inexpensive car insurance policies and various coverage levels. The initial action a car owner must do is to spend time shopping around, comparing different insurance rates and quotes provided by many insurance companies. When shopping for the best option, there are a couple of things to consider: affordability and the appropriate liability coverage needed. Liability coverage must comply with the protocol implemented and enforced by Florida state. This has relevance to the least amount of coverage ($10,000 for personal injury; $10,000 for the Property Damage Liability ($10,000 each, per accident). Furthermore, owners of high-performance cars tend to pay more premiums because they are most likely to have greater risk in car driving. Based on the retail value, expensive vehicles carry more Property Damage Liability (PDL) premium. This is so, because it’s costly to replace the parts of luxurious cars. In addition to these requirements, you must take into account what is the exact situation. For example, if your car is old, you must have only collision coverage policy that settles for the repair of the damaged car as a result of collision. Full-coverage involves comprehensive coverage, along with the collision coverage. Comprehensive coverage pays for the damaged cars which are repaired on the account of other circumstances, rather than collision. Your savings can go up to 50% for your car insurance policy. Aside from that, if you have a new car, you have more chances of getting lower premiums to pay. Current car models are digitally improved and are safer during traffic, as opposed to the older models. And if your car is old, you can install it with the latest safety features and the results will be a cheaper premium. 1. Figure out what creates insurance fraud. A person who is involved in insurance process is a candidate of creating insurance fraud, whether it’s the insurance company, an insurance claims adjuster, an agent or a consumer. For better understanding, insurance fraud happens when one person or entity purposely cheats another person for an unlawful intention. This occurs everywhere in the pipeline of insurance process—from purchasing and utilizing insurance to the deeds of underwriting and selling the insurance policies. 2. Understand the various kinds of premium diversion. Once insurance premiums get misused, it becomes one main reason for insurance fraud. Basically, premium diversion occurs if a trusted insurance agent receives the premiums for his personal gain—without the need of passing them to the underwriter. It only means that the insured person knows he’s paying his premium without knowing that the amount paid is diverted. 3. Learn about the impact of insurance fraud. Each year, the estimated total value of insurance fraud goes beyond $40 billion. Most of such costs have been passed along to clients since insurance firms need to increase premiums to every policy to cover the incurred losses caused by fraudulent doings. Because of this, an estimated cost for the additional premium each year reaches to $400.00 to $700.00. Have you experienced unexpected surprises with your health insurance recently? For instance, you have discovered that your regular physician is not anymore part of your deductibles or your network. If so, the option of open enrollment is the best way to make a change every year. Although you’re in favor of your coverage last year, it is still recommended that you shop around because better benefits may come by switching your plans. 1. Verify with your doctor. Before making the final decision for your health plan, don’t simply rely on the online directory provider which is kept by your insurance provider. If the specialist or doctor you favor with is included on the plan, check with your doctor by calling him up or visiting his clinic. The doctor may only join in some options but not on all plans offered by the insurer. Furthermore, online directories aren’t updated immediately or the doctor may have already left the network months or years ago. To be safe, always make a quick verification with your doctor.